These premium kayak car racks conveniently extend the hauling capacity to your vehicle. Carriers are designed to mount on to almost all types of factory or aftermarket flat, oval and square crossbars crossbars. Constructed of weather resistant epoxy powder coated tubular steel, this heavy duty hauler can hold up to 250 pounds and features a rubberized base and foam cushion on the arms and reinforced cargo strap patches to protect your cargo. These J-Bar style racks are very versatile and can carry many different types items such as skis, canoes, paddleboards, snowboards, and other outdoor gear. The J-Bar's open design makes loading and unloading easier. Each bracket measures approximately 17-1/4 inches long and 5-3/4 inches wide and 15-1/2 inches high (measurements do not include mounting hardware). Always secure your cargo with straps, bungee cords, or tie downs (not included) in a safe manner. 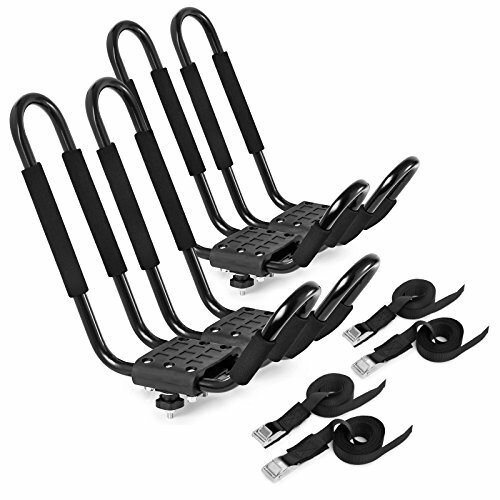 This kit includes 4 (2 pairs) J-Bar style kayak racks, mounting hardware, and instruction. If you have any questions about this product by Direct Aftermarket, contact us by completing and submitting the form below. If you are looking for a specif part number, please include it with your message.